As a Dog Mom with a focus on raising a healthy, natural dog, everything that comes into contact with Dexter comes under scrutiny. I have to think about Dexter’s food, the ingredients in his food, our yard, heartworm and flea prevention, and dog grooming products, including his dog shampoo. Doing so much research on each ingredient and each product can be daunting at times, but who’s worth it? Dexter’s worth it, Nutter‘s worth it! 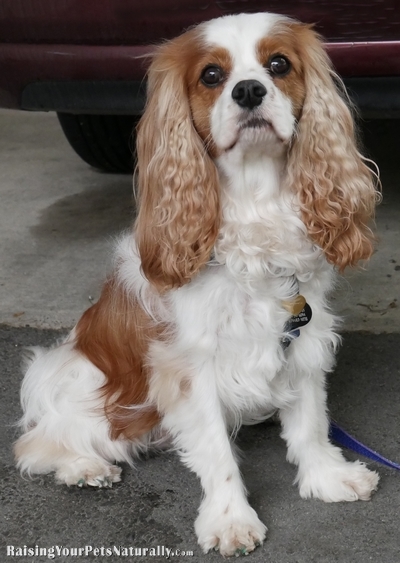 Dexter The Dog is a very active Cavalier King Charles Spaniel who is cursed with frequent baths because he loves to get dirty. He’s never a fan of bathing, but he’s always a trooper and very cooperative. When I’m looking for a natural dog shampoo, the first thing I do is flip over the dog shampoo bottle and read the entire ingredient panel. I avoid a long list of ingredients, including paraphens, sulfates, sodium lauryl sulfate, polyethylene glycol, potassium sorbate, phenoxyethanol, and many more. I am by no means a chemist, so I start my ingredient checking on EWG Skin Deep’s Cosmetic Database. Here, I am able to plug in any ingredient and see the risk factors involved with that ingredient and make my choice from there. 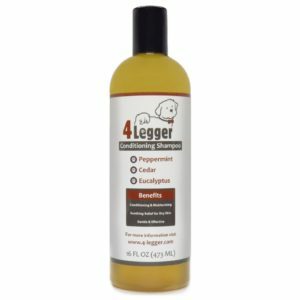 Today, I want to talk about 4-Legger conditioning shampoo. True to form, I read the entire ingredient panel and looked up each ingredient on the EWG website for toxicity. Every ingredient in this natural dog shampoo came back “green,” meaning little to no hazard. When considering ingredients, I also take into account what the product is being used for. For example, I would not feed Dexter a product that contains vegetable glycerine, as it tends to give him loose stools. I also would not feed him something with guar gum because that can bind the colon. However, for a topical product, these two ingredients are just fine and cause no concern. Now that the ingredients in 4-Legger shampoo check out, it’s bath time. Sorry, Dexter! Right away, I was greeted with the pleasant smell of peppermint. It was not overpowering – it was just the right amount. After thoroughly wetting Dexter, I poured some of the natural dog shampoo into the palm of my hand and applied to Dexter and began massaging it through his coat. I was pleasantly surprised at how well the shampoo lathered, since it did not contain typical foaming agents Sodium Lauryl Sulfate or Sodium Laureth Sulfate. Most shampoo manufacturers use Sodium Lauryl Sulfate or Sodium Laureth Sulfate to create their foaming action, which can cause organ toxicity. But 4-Legger was able to create a foaming action without the use of toxic chemicals. After massaging the shampoo from head to tail, I rinsed Dexter with warm water. A proper rinse is always key in a good dog bath. If you do not rinse thoroughly, your dog’s coat will have a sticky texture when it dries. After a good rinsing, I towel-dried Dexter, put on his dog drying jacket, and waited for him to fully dry. After Dexter was dry, I brushed him out. His coat was bright white and chestnut with a nice shine and a fresh scent when I smelled him. I am very pleased with the way 4-Legger Conditioning Shampoo performed during bathing, rinsing, and brushing. 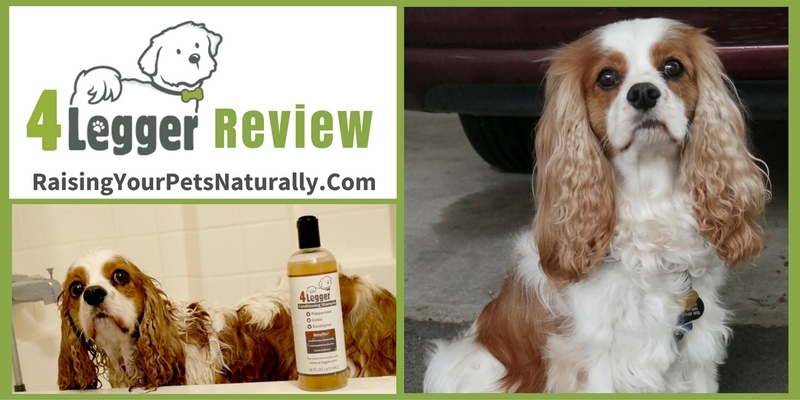 This is a great natural dog shampoo that you can feel comfortable using, and know it will do a great job getting your dog clean. I am happy to report, 2 weeks after Dexter’s bath, he is still silky and looking good, even after our Vermont vacation! 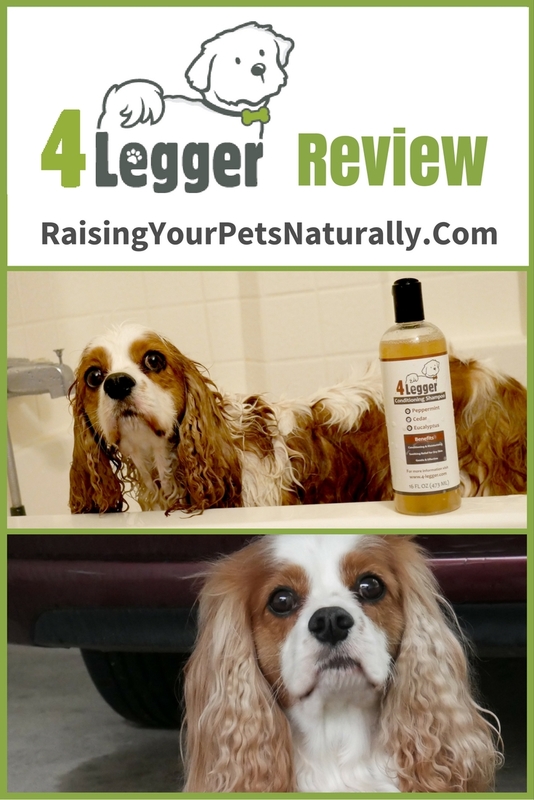 A big thanks to 4-Legger for their wonderful product and taking such care in providing a natural and safe dog shampoo line. After, bright, soft and tangle free. Order today with promo code RaiseNaturally20 for 20% off your order. We came across this pet grooming line the other day and we were very interested. Your review tipped the scales and helped us decide to give it a try! We are very careful to only use green/healthy items on our pups – shampoo, cream rinse, etc., so we appreciate your review! Dexter looks so fluffy and handsome after the bath! 😀 Thanks. He was/is super fluffy after the 4-Legger bath. Loving this shampoo. Thanks, Nichole. It really is nice and healthy. Thanks for doing all the legwork so we don’t have to!! Dexter looks fab but I know what you mean about how dirty he can get! Our Lyla has very sensitive skin and other issues so we have to be careful as well. I will check into this product since you trust it. Sweet Lyla. The company is great, so I would suggest reaching out to them. They have one that is pretty bare minimum. https://www.4-legger.com/collections/all/products/unscented-certified-organic-hypoallergenic-dog-shampoo Don’t forget promo code RaiseNaturally20 for 20% off your order. Haha, that sounds like Dexter. He’s a good boy, but HATES them. Mr. N gets bathed pretty often. He has hair not fur and gets grubby easily. This shampoo looks nice, I’ll have to look at it after we work through our giant shampoo stockpile. That reminds me, I have to bath my schnoodle – he stinks easily. But I too am careful about what I use because so much makes him itch. Also, a lot of people don’t know human shampoo is a completely different PH than what dogs can tolerate. Dexter looks so cute after his bath. Sounds like a good company. Kilo the Pug hates baths and stands there looking like the world is ending. He does not have that many as he is not a fan of mud either. Thank you. Oh, Kilo and Dexter would probably run off and pout together! 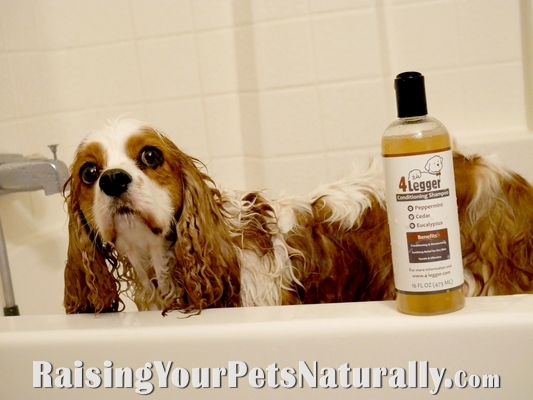 A good shampoo is so important for good skin health in dogs who are bathed regularly. I’m glad you found and are spreading the word about one that meets your high expectations. I used to bathe Gremlin too often but have found that his skin and coat health sky rocketed when I just stopped. Now he only gets baths after really muddy trips to the dog park. Thanks, Amber. Yes, if they get bathed too much, particularly if there are harsh chemicals, it can wreak havoc on the skin and coat. Glad Gremlin is doing well. This pet grooming line is new to me but, as always your review is thorough and extremely helpful and this is one we will definitely try! I am always looking for clean, natural products for the dogs and I appreciate being introduced to something new. Thank you! Thanks, Ruth. That’s great. Glad your line is working well for you and Layla. Good timing since I was just about out of Chip’s shampoo. I just placed an order, and thanks for the discount code! He gets a bath every 3-4 weeks in the summer, and less often in the winter months. I think he secretly likes his baths! Lol! It sounds like a good shampoo. Do you know if it is cruely-free? Yes, all of our ingredients are safe and non-toxic! We do test 4-Legger first on ourselves to see if we like the essential oil blends. Once we are happy with the blends we do a lot of dog washing to make sure you’ll love it as much as we do! That is awesome, I will have to get some for my gang! 😀 Don’t forget promo code RaiseNaturally20 for 20% off your order. I always like to buy natural products for my dogs! I need to share this with my mom so she can try it on her dog. Dexter is a cool boy. Wonderful baby. You did it really well. Highly appreciate your care. I’ll try this product too. Thanks. Thanks, Monica. I really appreciate that. Dexter is my heart.